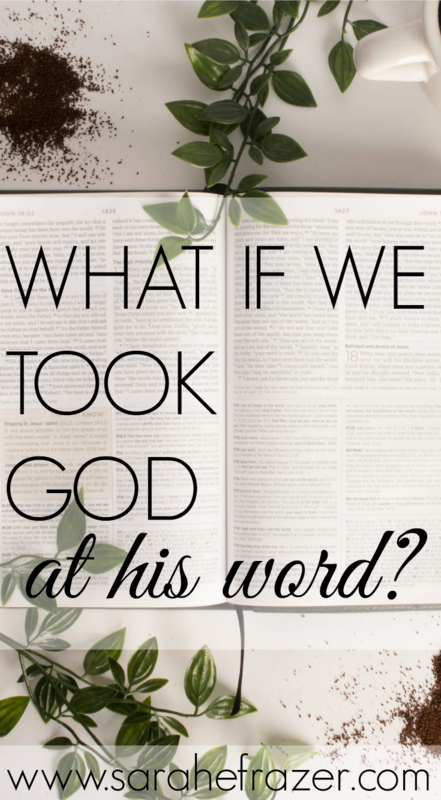 What If We Took God At His Word? On the first day of spring it snowed. Welcome to the Appalachian mountains. West Virginia holds four fluid seasons, but I’m ready for spring. Saying goodbye to winter with its cold, dark nights, and germs. Winter has been long this year. Not necessarily super cold or lots and lots of snow, but it seems like it started early in October and now into the later part of March we are shoveling the white stuff off of our driveway again. Winter’s promise still rings true. God is faithful in the seasons we don’t see growth. God’s faithfulness is the theme of my story. It keeps coming back again and again. I like people who are consistent. My Dad was like this. I never questioned where I stood with my dad. I knew he loved me, although he never had to say the words, he showed me with his actions. Just like my earthly Father, my Heavenly Father reveals through the seasons how He’s been faithful through His actions. From the small giggles at night to the hugs each morning, God reminds me with my children’s love that He loves me too. And God’s love is the best, isn’t it? The faithful love of God reminds me when life is brown and gray – spring is coming. The snow cannot hide his warmth and love. No matter how much we feel forgotten, His faithfulness does NOT forget us. The Word of God promises it: and we can take God at His word. One of my dear writer friends recently said she just takes God at His word and I love that. God is faithful. No exceptions. God’s Word is for me; and I can learn how to understand it. Prayer truly changes things. Powerfully. The Spirit is working in my heart even when I can’t see it. God works out the details. As a control-freak, planner loving gal I struggle with letting go and trusting. But goodness. After thirty years of following God I cannot say He has disappointed me once. Have I suffered? Yes. Do I mourn the death of loved ones? Of course. Have I felt the sting of loneliness. You bet. But God is truly the faithful one – no matter the season. Spring, Summer, Fall, or Winter – God is in control of all. What will you take God at his word this year? This month? For today? How would your life look different if you took God’s Word as 100% true and put your utter faith/trust in it? I’ll tell you what would change in my life: my anxiety. Yes. I struggle with the feelings anxiety – specially at n night. It comes out in frustration and irritation when things don’t go as planned (aka when the people in my life are disrupting my plans). So what changes when I realize God is in the details (even the ones I don’t like)? I can rest and not let the anxious thoughts take root. Sometimes I can’t help the moment; but I can help thinking and dwelling on everything. What would change if you took God at His word?